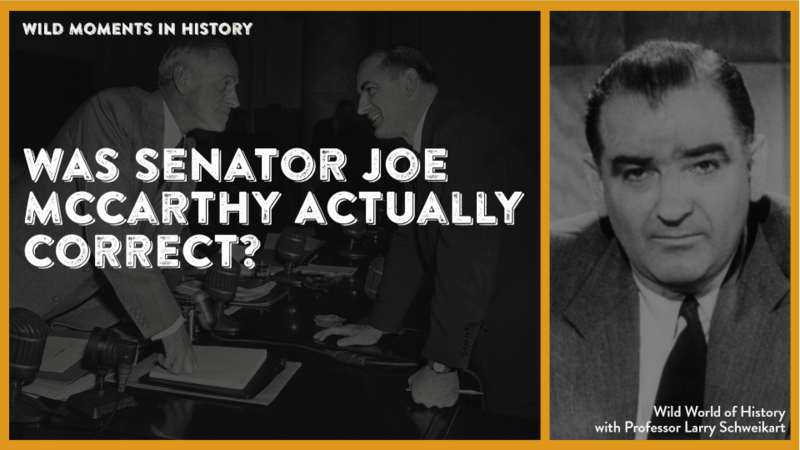 Was Senator Joe McCarthy Actually Correct? Did you know that almost every person Senator Joe McCarthy named as a communist in public ... was ACTUALLY a Soviet agent? These were names already provided to the House Appropriations Committee whose cases were still pending. That’s where the confusion came in: he then cross-referenced that list with another one of 284 security risks given him (of whom 79 had already been dismissed) for 205 names and 57 still employed. Historians have obsessed with the different numbers, but a surviving copy of his speech that day show that he has “205" crossed out and “57" written in, and he said only 57 were still in government. As noted in another “Wild moment,” the most important Soviet spy was not in the State Department, but in the Treasury Department, where the assistant Secretary of the Treasury, Harry Dexter White, was a full-fledged Soviet agent. He was aided there by Solomon Adler, Frank Coe, and Harold Glasser (whom he personally recruited). And in the Agricultural Adjustment Administration, there was Alger Hiss. Even FBI director J. Edgar Hoover estimated there were 200-400 active Soviet spies in the US. McCarthy just thought most of them were in government. If anything, though, McCarthy underestimated the degree of penetration in the Roosevelt/Truman administrations: Laurence Duggan at Treasury, Michael Straight at State, John Abt at Justice. One of McCarthy’s supposed “victims,” Owen Lattimore, who was editor of Pacific Affairs, was specifically named by McCarthy as one who behaved like a Soviet agent—but McCarthy never actually named him. On the very day the Tydings Committee announced that the U.S. government was “free of Communist infiltration,” Julius Rosenberg was arrested for espionage. In fact, McCarthy’s “names” included Gustavo Duran, Mary Jane Keeney, Edward Posniak, John Carter Vincent, and Lattimore, and a 1954 article revealed that every security or loyalty risk McCarthy brought forward had either resigned or been dismissed from government. Other Soviet operatives that McCarthy named were T. A. Bisson, Cedric Belfrage, Leonard Mins, and William Remington. If anything, McCarthy was too late. By the time he identified them, the FBI had been watching them for years—yet they retained their jobs. For further reading, see M. Stanton Evans, Blacklisted by History.